In 1926, the Willits Development Association came up with the idea of sponsoring a community activity to raise funds for the construction of a much-needed hospital. 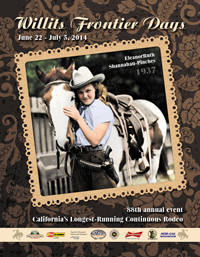 Through the efforts of many prominent citizens including Dr. Raymond Babcock, Frank Taft, Judge E.M. Whitney, Judge Fred Foord, Deed Wimmer, Frank and Bill Whitney, Joe Quadrio, Edward Morris, Carl Edenfeldt, Allen Sacry and the American Legion Post, a plan was hatched and the first Willits Frontier Days Rodeo occurred in July 1927. It was coincidentally at this same time that Frank R. Howard, the young son of Ridgewood Ranch and Seabiscuit owner Charles S. Howard, was fatally injured in an automobile accident at the ranch. The boy's doctor, Dr. Babcock approached Howard about erecting a hospital in Willits in memory of young Frank who did not survive the fatal crash. Charles Howard agreed and decided to build the Frank R. Howard Memorial Hospital shortly thereafter. Even though the original idea of having a rodeo to fund construction of a hospital was no longer necessary, the American Legion decided to carry on with their plans for the event anyway. The celebration was an instant success, and the American Legion ran the show until 1932 when the Willits Volunteer Fire Department accepted the leadership role. Looking to the future, the fire department borrowed money to improve the rodeo grounds by having individual volunteer firefighters sign promissory notes. 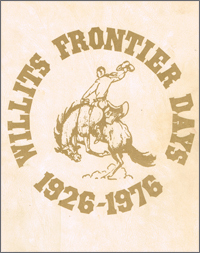 The Willits Frontier Days Association was born and incorporated in 1950 when a group of local businessman and ranchers took over the proverbial 'reins' of the event. 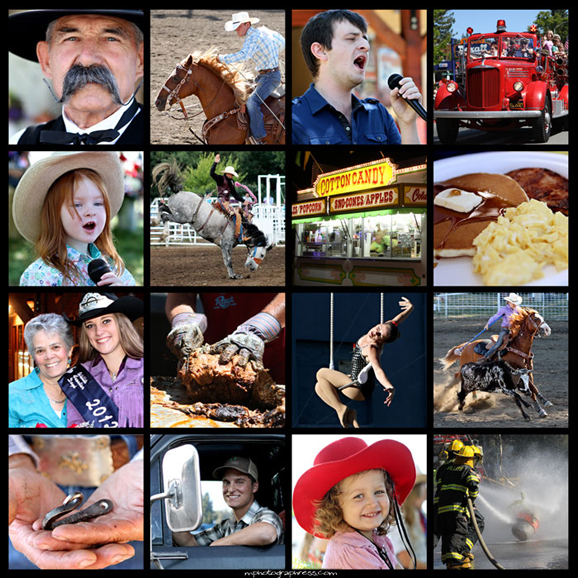 The continuity of Willits Frontier Days has remained unbroken since 1926. 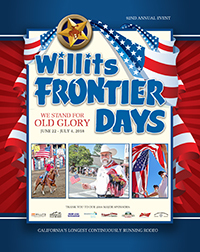 A non-profit organization, Willits Frontier Days still operates as it did in the beginning with no individual or organization getting any financial reward. Residents and clubs work together to put on the events and decide together how to spend the profits of each show to benefit our community. 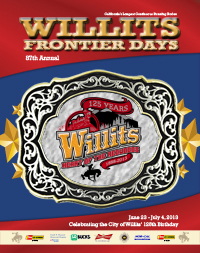 Interested in getting involved and helping the tradition of Willits Frontier Days continue in to the future? 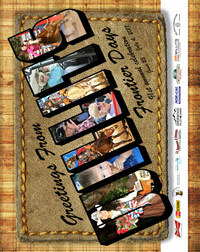 Call 707-459-6330 or email us at: willitsfrontierdays@gmail.com for information on joining. 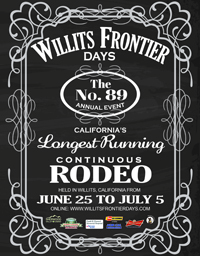 Willits Frontier Days is a non-profit organization and we work hard to use monies earned to improve the grounds, support the spirit of rodeo, contribute back to the community and keep this cherished tradition alive and well in Willits for many more years to come. Currently, we are looking to totally upgrade our aging grandstands. Any amount helps and will be greatly appreciated.